Nicole Chanrion grew up helping her father in the vineyard and the wine cellar in the Côte-de-Brouilly. She officially began her career as a vigneronne in 1970 and took over the family domaine in 1988 where she tends to 6.5 hectares of vines. She does it all; prunes the vineyards, drives the tractors, makes and bottles the wines. 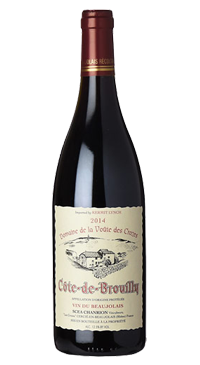 She holds the position of President of the Cote de Brouilly appellation and is respectfully considered by her peers to be “La Patronne” or “the Boss” of la Côte. The Côte-de-Brouilly appellation sits on the hillsides of Mont Brouilly, a prehistoric volcano that left blue schist stones and volcanic rock along its slopes. These stones yield structured wines with pronounced minerality and great aging potential. This is a plush, incredibly easy drinking red wine.